1“Death Overtakes Peoples’ Leader,” 11 January 1906, Santa Fe New Mexican: 1. 2Eighth Census of the United States, 1860: Population Schedule, Alameda, Bernalillo, New Mexico Territory, Roll M653_712, page 93, http:// search.ancestrylibrary.com (accessed 6 January 2011). According to the census, José Leandro Perea owned real estate worth $25,000 and personal property worth $200,000. 3“Pedro Perea,” in Maurilio E. Vigil, ed., Los Patrones: Profiles of Hispanic Political Leaders in New Mexico History (Washington, D.C.: University Press of America, 1980): 84–86; Carlos Brazil Ramirez, “The Hispanic Political Elite in Territorial New Mexico: A Study of Classical Colonialism,” Ph.D. diss., University of California–Santa Barbara, 1979: 306. 4“Death Overtakes Peoples’ Leader”; “Distinguished New Mexican Closes Career,” 11 January 1906, Santa Fe New Mexican: 1. 5Tenth Census of the United States, 1880: Population Schedule, Bernalillo, Bernalillo, New Mexico, Roll 802, page 7A, Library of Congress, Washington, D.C., http://search.ancestrylibrary.com (accessed 6 January 2011). 6Territory of New Mexico, Report of the Secretary of the Territory, 1905–1906 and Legislative Manual 1907 (Albuquerque: Morning Journal, 1907): 170–173. For accounts of Perea’s work on the territorial council, see, for example, “Pedro Perea,” 20 October 1890, The Daily New Mexican (Santa Fe): 2; Mr. Perea’s Record as a Legislator,” 13 October 1898, Santa Fe New Mexican: 2; “Friend of Albuquerque,” 18 October 1898, Albuquerque Daily Citizen: 2; “Our Next Delegate,” 19 October 1898, Albuquerque Daily Citizen: 2; “Hon. Pedro Perea, Republican Candidate for … ,” 22 October 1898, Santa Fe New Mexican: 2; “Mr. Perea’s Legislative Record,” 24 October 1898, Santa Fe New Mexican: 2; “Perea and the Miners,” 2 November 1898, Santa Fe New Mexican: 2. 7“Pedro Perea,” Los Patrones: 84; Ramirez, “The Hispanic Political Elite in Territorial New Mexico”: 306–307. 8Ramirez, “The Hispanic Political Elite in Territorial New Mexico”: 306–307; Ralph Twitchell, Leading Facts of New Mexican History, vol. II (Cedar Rapids, IA: Torch Press, 1912): 523. According to Twitchell, the fact that Senator Stephen B. Elkins of West Virginia—a former New Mexico Delegate who favored Perea—failed to keep an appointment with McKinley and Secretary of the Interior Cornelius Newton Bliss helped Otero win the seat. In his memoirs, Miguel Otero, Jr., cites his longtime friendship with William McKinley as the primary reason for his appointment. See Miguel Otero, My Nine Years as Governor of the Territory of New Mexico, 1897–1906 (Albuquerque: University of New Mexico Press, 1940): 1–28. 9Robert W. Larson, New Mexico’s Quest for Statehood: 1846–1912 (Albuquerque: University of New Mexico Press, 1968): 194–196. 10For information about Perea’s nomination, see “Pedro Perea Nominated,” 1 October 1898, Santa Fe New Mexican: 4; and “County Republicans,” 30 September 1898, Albuquerque Daily Citizen: 1. For Perea’s endorsements, see “The Republican Nominee for Delegate,” 3 October 1898, Santa Fe New Mexican: 2; and “A Practical Man Needed,” 8 October 1898, Santa Fe New Mexican: 2. 12“A Dangerous Game to Play,” 11 October 1898, Santa Fe New Mexican: 2; for an example, see “An American Citizen,” 22 October 1898, Albuquerque Daily Citizen: 2. In “Campaign of Abuse,” 13 October 1898, Santa Fe New Mexican: 2. An editor for the New Mexican wrote: Democrats “admit his ability, concede his honesty and that his public and private life is beyond criticism, but close each paragraph with sneers at his candidacy. They do not have the manhood to come out and give their real reason, which is racial prejudice.… They will not vote for any one unless he speaks the dialect of West Virginia with a limpid drawl.” For a colleague’s defense of Perea, see José D. Sena, “Hon. Pedro Perea’s Campaign,” 4 November 1898, Santa Fe New Mexican: 2. 13“Race Issue Talk,” 21 October 1898, Albuquerque Daily Citizen: 2. The article reports, “All over this territory the democrats are working the race prejudice racket for all it is worth.” See also “They Will Not Succeed,” 20 October 1898, Santa Fe New Mexican: 2. 14“An American Citizen,” 22 October 1898, Albuquerque Daily Citizen: 2. 15Twitchell, Leading Facts of New Mexican History: 543; Territory of New Mexico, Report of the Secretary of the Territory, 1903–1904, and Legislative Manual, 1905 (Santa Fe: The New Mexican Printing Company, 1905): 48. Perea received 18,722 votes, and Fergusson received 16,659. 16Calvin A. Roberts, “H. B. Fergusson, 1848–1915: New Mexico Spokesman for Political Reform,” New Mexico Historical Review 57, no. 3 (July 1982): 246–247; “Perea’s Election,” 11 November 1898, Santa Fe New Mexican: 2. Roberts writes that the 1898 campaign was difficult for Fergusson: “Silver disappeared as a dominant issue, replaced by popular enthusiasm for the war with Spain, which benefited Republicans.” Also, Fergusson was blamed for his supporters’ race-baiting tactics. 17Garrison Nelson et al., eds., Committees in the U.S. Congress, 1789–1946, vol. 3 (Washington, D.C.: CQ Press, 1994): 817. 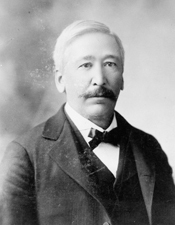 18Of Perea’s nine Hispanic predecessors in Congress in the 19th century, only three New Mexican Delegates (Mariano Otero, Tranquilino Luna, and Francisco Manzanares) served on committees, as a result of changes to the House Rules in 1871 and 1880. They served on the Committee on Coins, Weights, and Measures, whose jurisdiction included the standardization of coin values, legislation related to mints and assay offices, and the creation of national standards for weights and measures. Manzanares also served on the House Select Committee on the New Orleans Exposition. According to political scientist Charles Stewart III, the Committee on Coins, Weights, and Measures was ranked 53rd out of 69 committees in terms of its attractiveness to Members. Conversely, Perea’s committee assignments were very desirable (Military Affairs ranked 13th, Post Office and Post Roads ranked 14th, Private Land Claims ranked 25th, and Territories ranked 29th). For an analysis of committees’ attractiveness to Members during this period, see Charles Stewart III, “Committee Hierarchies in the Modernizing House, 1875–1947,” American Journal of Political Science 36, no. 4 (November 1992): 835–856 see especially Stewart’s table on “Committee Attractiveness,” pp. 845–846. 19Congressional Record, House, 56th Cong., 1st sess. (4 December 1899): 10. Perea submitted this bill the day he was sworn into office. The bill was printed in “The New Mexico Statehood Bill,” 11 December 1899, Santa Fe New Mexican: 1. 20Congressional Record, House, 56th Cong., 1st sess. (14 March 1900): 2884–2886. Perea provided legal documentation about the city’s original area to support his claims. 21Larson, New Mexico’s Quest for Statehood: 196–197. Interestingly, Larson dismisses Perea’s tenure because he “was not a dynamic, forceful personality.” In making this assessment, Larson compares Perea’s efforts to those of his peers: Delegate John F. Wilson of Arizona, who submitted two statehood bills and was assisted by a companion bill sponsored by Senator Clarence Clark of Wisconsin; and Delegate Dennis Flynn of Oklahoma, who submitted three statehood bills. None of these bills became law. 22Congressional Record, Index, 56th Cong., 1st sess. : 545; “Pedro Perea,” in Los Patrones: 85. Papers: In the Thomas B. Catron papers, 1692-1934, 259 boxes. Perea included among correspondents. Papers: In the Marion Dargan papers, 1890-1943, 4.2 cubic feet. Subjects covered include Perea. Papers: 1899, 1 leaf. A letter from Perea to D.F. Rugg written on December 11, 1899. In the letter, Perea transmits memorial addresses on Senator Justin S. Morrill. "Pedro Perea" in Hispanic Americans in Congress, 1822-2012. Prepared under the direction of the Committee on House Administration by the Office of the Historian and the Office of the Clerk, U.S. House of Representatives. Washington: Government Printing Office, 2013.